NGC 247 (aka Caldwell 62) is a dwarf galaxy located in the constellation of Cetus. The galaxy is a member of the Sculptor group which includes NGC 253. NGC 247 has an apparent dark hole which is a region that contains a paucity of stars and new star formation. This hollow region resembles the eye of a needle, giving the galaxy its nickname. The field includes a number of background galaxies which are at much greater distances than NGC 247. 4 of these galaxies are below and to the left of NGC 247 and are collectively known as "Burbidge's Chain". In this image, North is to the left. This image is cropped to 79% of the original full frame. Software Used Images Plus 5.0 for camera control, calibration, stacking, digital development, Lucy-Richardson deconvolution, multiresolution sharpening, smoothing and noise reduction. Photoshop CS5 used for levels and curves, selective color, high pass filter, star shrinking, lab color, saturation adjustments, screen mask invert, lens correction, match color, and smart sharpen. Gradient Xterminator for gradient removal. Carboni Tools for additional saturation adjustments, noise reduction, and smoothing. HLVG for additional color correction. Registar 1.0 for stack alignment. Notes NGC 247 turned out to be a challenging galaxy to image. The galaxy and the surrounding background galaxies have some very nice fine detail, but NGC 247 has a rather low surface brightness. While I had a total of 14 hours of exposure for this object, some of this was gathered during periods of poor transparency. Additionally, I used focus stacking to gather sharp data across the entire field, so the main galaxy doesn't benefit from a full 14 hours of exposure. Accordingly, the noise in the primary galaxy is a bit higher than I would have preferred. This image was published in the October 2014 issue of the German astronomy magazine Sterne und Weltraum(means Stars and Space in English). My first publication in a European magazine! This image was published by Astronomy Magazine as its Picture of the Day for January 24, 2013. Its my 5th Astronomy Magazine Picture of the Day and my 3rd one in the last month! 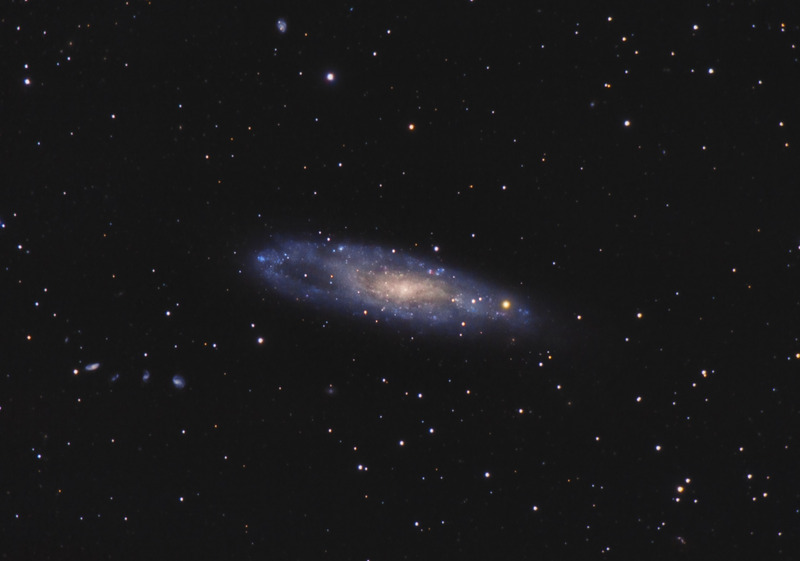 This image also won first place in Astrophotogallery.org's Galaxy category for December 2012.